The experience you'll remember for a lifetime! SKYDIVE CEBU ADVENTURES – SKYDIVE GREATER INC., The only USPA (United States Parachute Association) Member dropzone in the Philippines. A place to do Tandem Skydive and become a licensed skydiver with our certified/professional Tandem and AFF (accelerated freefall) Instructors. 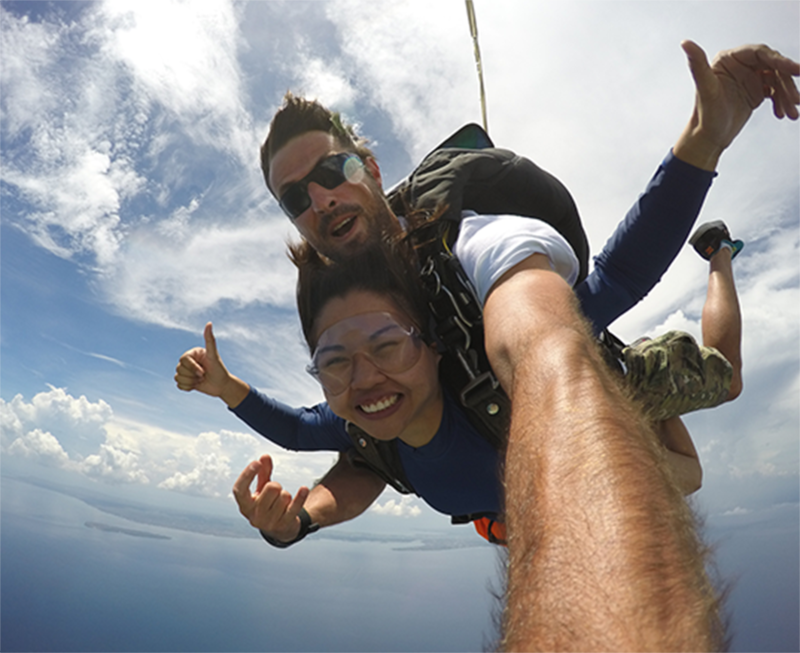 Accept nothing less when doing Skydiving in the Philippines. 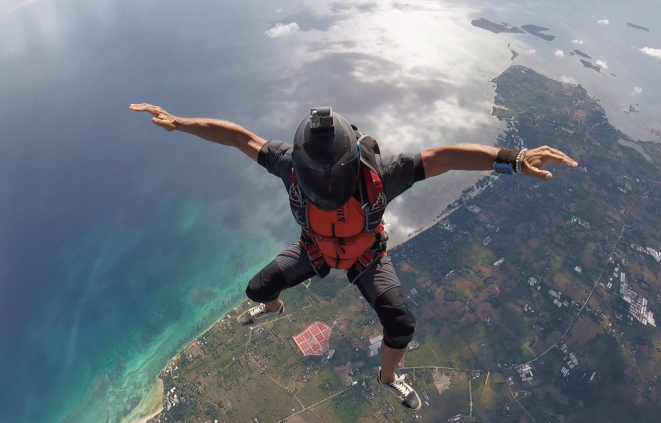 We have two location as of the moment – Skydive Greater Cebu located in Santa fe, Bantayan Island, Cebu and Skydive Greater Siquijor in Siquijor, Siquijor. Our fleet of airplanes are leased to Southern Air Flight Services Inc. including its maintenance and operation. Our gears and all skydiving equipments are leased to Skydive Greater. As far as we’re concerned, nothing beats the rush you get from throwing yourself out of a soaring plane! If you’re anything like us, after your first jump, you’ll be hooked. Whether you’re interested in just a tandem jump, or getting your solo certificate, we’re where you want to be. All our jumps meet the highest standards for safety. With a certified USPA instructor, uses the most modern equipment in the market today, have our planes and gear checked by a third-party inspector. When you go for a skydiving adventure at OUR DROPZONE, you become part of our family. We want you to be happy with every part of the experience, from when you sign up to when you meet land again. It’s our goal to make sure every moment is the thrill of a lifetime. 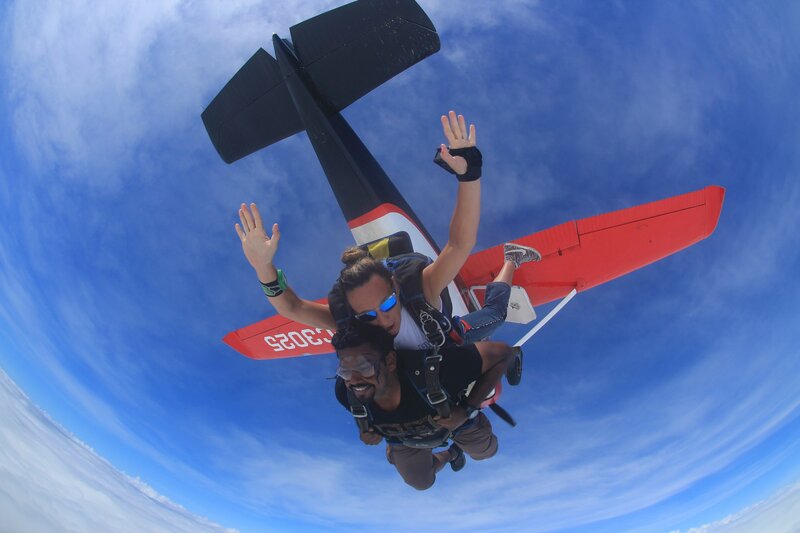 Skydiving is an extreme adventure, one that many people add to their “bucket lists.” When you take a jump with us, we’re helping you accomplish a goal — whether it’s overcoming a fear or taking an item off that list. We’ll help coach you to achieve your goal, but we’ll never pressure you to do something beyond your comfort zone. It’s safe to test your limits with us. We’ll keep you safe. A Tandem Skydive involves a student skydiver harnessed to a Tandem Instructor. Our team is not only dedicated to giving you the thrill of a lifetime, but we strive to teach you the basic fundamentals of skydiving (exit, free fall, piloting the canopy, and landing). We hope that you will walk away with excitement in your eyes and the desire to return for more! 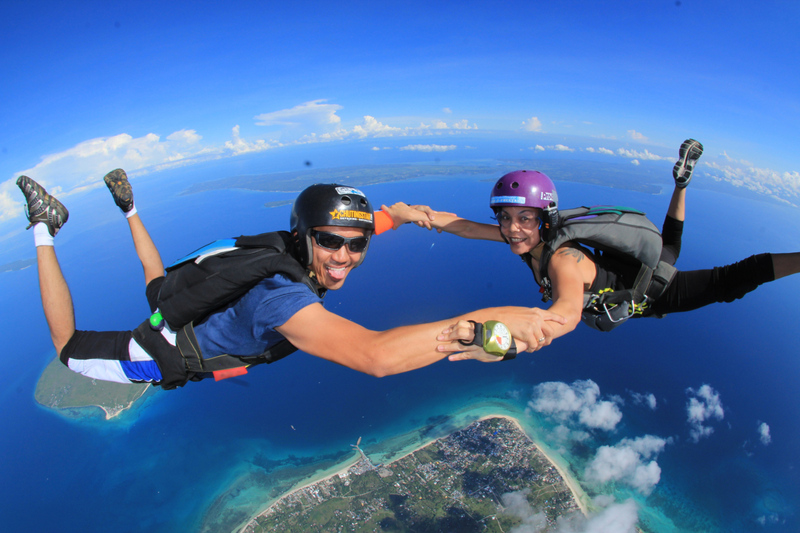 Skydive Greater Cebu offers the best Tandem Skydive experience at the cheapest prices! Nothing’s going to impress your Facebook friends more than photos of you (and two dozen of your closest friends) skydiving! 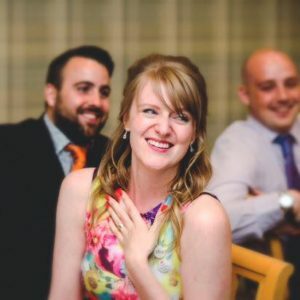 Want a little support on your skydiving journey? Take a tandem dive with one of our certified tandem instructors and enjoy the thrill of a lifetime. 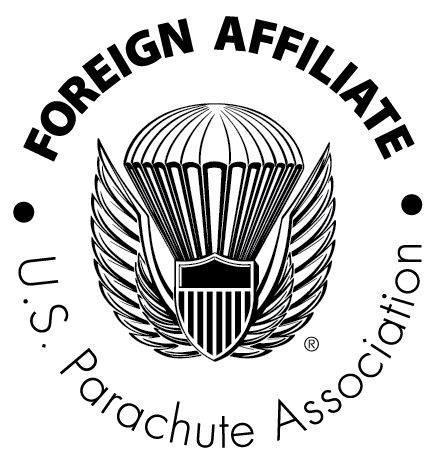 Get your USPA A license with our certified USPA AFF (accelerated free fall) instructors. You must present your log book and USPA or any FAI issued license in order to jump. Non-current jumpers are required to attend refresher training. If your bringing your own gear your reserve repack must be up to date. "Life is either a daring adventure or nothing, and its all best when i came far out of my comfort zone. I decided to try it rather than to be afraid of it, and thank you so much Terry for assuring my safety going up (10,000 ft. above the sky) till we landed. such and awesome experienced, indeed! and everytime im in travelling and im inside the plane, i always remember how beautiful to look up in the sky. such a beautiful scenery and memories. #craziest thing #but keeps me wanting to go for more.#thank you #Boyd"
"I vividly remember those seconds of free fall. Have that vivid feeling and memory too! All one has to do is take that courage to jump, enjoy and as a popular Pinoy expression goes - "bahala na si Batman" and in this scenario, a chunk of that Batman is your dive instructor." 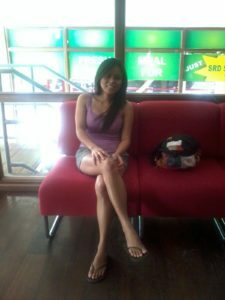 "Skydive Greater Cebu is one of the most highly recommended place to tick off your bucket list. Jumpmasters are very professional, friendly and accommodating. Will definitely come back soon!!!" "I so freakin' love it...its the best thing I've ever done in my life and don't mind doing it again...from the fly to the fall and staying in the air its very exhilarating and love everything about it. The crew are so nice and accommodating even though I'm late from our scheduled time they patiently waited for me. Thanks guys till next time...I'm looking forward for my next jump ." "Where to begin?!?! The staff are warm and friendly. I'm petrified of heights but I felt safe with Terry. He explained everything clearly and held my hand as I literally shivered with fear on the journey to the top... If you're in Cebu, check this place out! They're professional, incredibly experienced and simply lovely people. You will 100% regret not doing this if you have the chance! Cheers, guys!" Copyrights © SkyDive Cebu Adventure 2016 All rights reserved.